<meta name="description" content="Secluded large ocean front home on Water Island. Spectacular views! Minutes from the beach vacation rental. 4 bedrooms. Kingsize beds. Large deck. Sleeps 8. " /> Perched on the edge of a 50' bluff, you'll enjoy breathtaking panoramic ocean and islands views, a steady breeze and the sounds of the ocean. All this and you are just minutes from Honeymoon Beach - one of the most beautiful beaches anywhere. Flamingo Point USVI is one of the largest homes on Water Island and offers over 3,000 square feet of deck. The house is located on a ~1 acre lot at the end of Lookout Point Road on the southwestern-most tip of the Island . Private and secluded -There is no drive by traffic and the house cannot be seen from the road. The view to the north: you'll watch as St. Thomas glides into the evening as lights begin to appear and illuminate the countryside. To the west, the view is of the Caribbean islands Saba, Vieques, Culebra and, off in the distance on a clear day, the top of El Yunque National Forest on Puerto Rico. 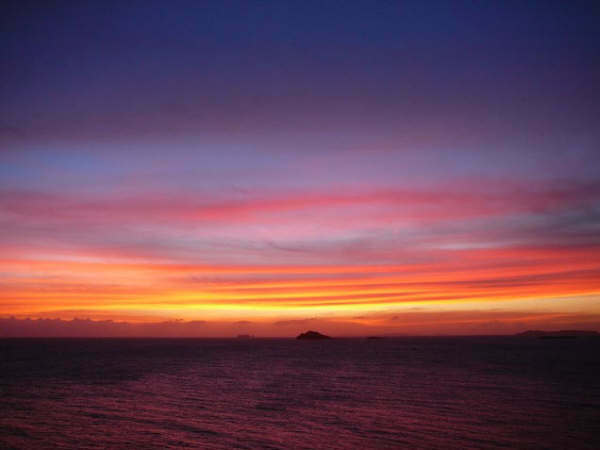 Of course, the always stunning Caribbean sunsets are a wonderful tribute to the end of each day. The view to the south is of the Caribbean sea and St. Croix. Cruise ships, fishing boats, sailboats - you will watch all types of marine vessels passing just outside your window. In addition to the view, you will hear the soothing sound of the waves breaking on the rocks below the house. There are no stairs or steps to cross the short distance from the expansive parking area to the front door. The house has a great room that delivers true open concept living. The dining area offers a beautiful teak table with comfortable dinning for 8. The living area has plenty of comfortable seating and entertainment center. Our home has 4 private bedrooms each with a king size bed and 2 bathrooms. The deck on this house was inspired by Caribbean sunsets and outdoor living. Wrapping around the entire home, guests will gravitate to the expansive covered porch where they find comfortable furniture for relaxing and dining. The home has a state of the art UV filtration system. For transportation, we offer the “Flamingo Warrior" (4x4, Crew Cab truck with safari in the back). Guests have access to the billiard table and laundry room on the lower level. There is a wide variety of most everything you and your crew may need to maximize fun and enjoyment at the beach including beach towels, umbrellas, floats/rafts, and coolers. We work very hard to maintain and improve our home to ensure that it's comfortable for us, our family, friends and guests - Flamingo Point will feel like you're home away from home as soon as you walk in the door. Throughout the years we have explored many properties - each with their own unique view. After all our searching we discovered it is more than just a view and rather a combination of things that makes a location spectacular. The view IS important. It’s been said that the view might as will be a picture if it never changes. At Flamingo Point you will find a view in constant motion - always changing, always moving, always inspiring. Click on "The View" page of this web site to see what awaits you. From the porch you will notice: the waves against the rocks that surround the property, water splashing into the air around the Porpoise rocks that mark the edge of the shipping channel if only a nautical mile west of the house, a constant parade of cruise ships, container ships barges, fishing and dive boats, mega yachts and every kind of sail boat you ever imagined. You'll feel the constant breezes and the sound of water crashing against the rocks at the base of the cliff. These things coupled with both sunrise and sunset views, private secluded property, spacious island transportation for your crew and all their cargo, large covered porches, a well appointed and stocked kitchen, a comfortable house with an expansive floor and deck layout for family or friends, the warm, beautiful beach and friendly residents of Water Island. We have found paradise and believe that you will as well. Whenever you hear an island calling your name or just need a latitude adjustment, Flamingo Point USVI, has everything you could want and more in a tropical paradise. Contact us today!